Happy Friday, all! It’s the final day of our Teacher Appreciation Week Giveaway Extravaganza at The Mailbox Blog. We’ve had loads of fun and we hope you have too! 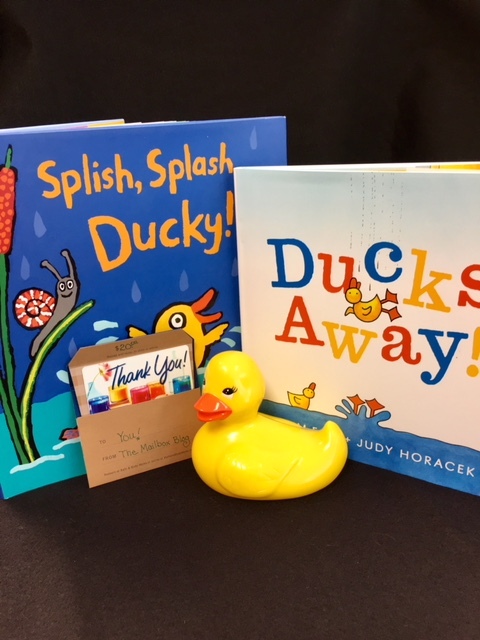 Today’s giveaway includes a duck (yes, it’s a rubber one), two adorable duck books, and—wait for it—a $20 THANK YOU gift card for Bath & Body Works. Every teacher deserves to be pampered, don’t you agree? ways to unwind or be pampered. Just be sure to do this before midnight, May 13. Sending bunches of TLC (Teacher Lovin’ Care) your way! PS: Remember to enter all five of this week’s giveaways plus our First Friday Giveaway for the month of May before midnight, May 13. I love to sit on my deck and watch my own children play in the yard. I treat myself to a pedicure. Sit quietly with “Tea Time” magazine or a decorating book and a cup of tea! Taking a nice warm bath with aroma therapy sents while listening to calming music. Take a hot bath with a bath bomb! I nice hot jacuzzi, candles, and a drink. Reading a book on the porch while the dogs romp in the yard! talk and joke with each other. One of my sons lives far away so I don’t get to be with them very often. I have always just loved being with them and marveling at how different yet how close and talented they both are! Reading, going antiquing/garage sales or playing with my brand new granddaughter!!! Curl up in my chair with a good book! I love sitting on my deck with my husband enjoying our favorite wine and hors d’oeuvres. I love to go to the salon and have my hair cut, washed and styled. I love to get a drink and sit down to read with only a few lights on and no noise. Reading a good book while sitting in a warm, bubbly bath. I love my early morning run with my husband even though he is way far ahead of me and walking our Newf. I love to unwind by relaxing with my husband and children. Tea, a good book, and a comfy recliner. Sitting down to read a good book. Getting my nails done ! Sit on the couch with the dogs in my lap. I love to have a glass of wine and relax on the couch…a couple times a year I save up some money to spoil myself with either a mini or pedi!! Then I’m relaxed and have pretty nails!!???? My fave way to unwind is to spoil myself with a pedicure while reading a great book! I love gardening. It really helps to relieve stress and the end result is beautiful. I sit and enjoy the peacefulness of the outdoors. A lovely dinner out with my amazingly patient husband. Hot bath, pedicures, Netflix…not all at the same time! ???? I relax listening to the song birds in our neighborhood while savoring a cup of hot coffee. I also am fond of a session in my craft room creating greeting cards. A massage is my favorite! My husband buys me one at the end of every school year! Sit or lay outside in the fresh air & sunshine ???? I love to garden or work on counted cross stitch to relax! Curl up on the couch with a glass of wine, warm blanket, and a Harry Potter DVD! Going to the beauty salon and having manicure and pedicure???? Get in a comfy chair with a beverage and a good book! Watching tv on the couch with my husband. Having dinner and drinks with my husband and daughters….love family time! My favorite way to relax is date night with hubby! I like to relax in my recliner with a good book a cat sleeping in my lap. Reading a good book, and drinking a cup of tea. I like to take a quick shower, get in my pajamas, lay in bed and read. I love to sit with my cat Max in my lap purring as I pet him. I used to have a pet duck who lived in the house with us. And, she also liked to sit in my lap while I petted her. But, she also liked for the TV to be on, and she watched TV as I petted her. After I leave the preschool, I just like to go home and reflect, no tv, no computer, etc for a little bit. No sound, peaceful! Hot shower, pj’s and spending time with my dogs. A walk on the beach. I love painting my nails! I love to ride down the highway and turn up some old school jam. A good cup of coffee on a cool day sitting on a wrap around porch is my dream. I love to curl up on the couch at night with a glass of wine and my puppy. Coffee, my best friend, and a bookstore (used or new)! Love to get lost in books. Then, I love to bring them home and read everywhere! I love to unwind drinking a large cup of Sweet Tea while soaking my feet in hot water or outside working in my flower garden planting flowers or pulling weeds out. Discovering new flower growth. I like to plant variety of plants for the bees,birds and butterflies. Also, playing with my two pitbull girls after a long day at my Child care center. Love my job!!! Hot shower, pj’s, and curl up with a good mystery book. Heaven! Watching Hallmark movies & chatting with my best friends about the week!!! A good book and an ice cold lemonade in the summer. I love taking a hot relaxing bath with a book to read! Spending time with my family. I love to read a good book on a well-shaded porch! My favorite way to unwind is to listen to my Irish music, read a good book and drink my coffee!! I unwind by feeding the ducks in my own pond! After a crazy day in pre-k I love to either 1)hang out with my special someone and watch tv 2) go for a long tough bike ride 3) run run run! Relax and play a mindless app! A good murder mystery and a cup of coffee! I love a good pedicure, but really enjoy a nice, quiet early morning or evening walk, as well. Relaxing with good friends and family on the back porch or by the pool. Snuggle time on the sofa with the Hubby is the way I like to relax. Spending quiet time at home working in my flower beds with my family is the best! I love coming home and taking off all the trappings of the day; work clothes, shoes, jewelry, etc. Then I change into comfortable jeans and a top and watch a movie or show on Netflix. Eating out and then watching Netflix to unwind! Usually do some journaling or drawing ! A glass of wine and a good book! I like to unwind by having a spa day with some friends or by taking a nice warm bath. Going with my mom and sister for pedicures. Or just spending some quiet time reading alone. Love sitting on my deck watching the birds and flowers! Being at the ballfields watching my boys! An ice cold Diet Coke does the trick for me!! Reading a good book on my couch. Reading! It’s an instant get-away! Can’t wait for school to be out and I can read more! After a day of teaching, my favorite thing to do is go run 4-5 miles or workout / practice with my Varsity cheerleaders! Sit out side & watch my dogs run around & play in the back yard.enjoying the sunshine & if there’s a nice breeze it makes it even better!???? Listening to music or watching TV and movies. I enjoy reading when I can but my favorite escape is just spending time with my son. He is 13 so he would rather do anything else. Getting time to myself to get a mani/pedi. Getting into comfortable clothes, lounging on the couch under my favorite blanket with some of Caribou Coffee’s hot chocolate! Just to sit with family and friends or sometime in the quite. Reading and sewing are my favorite ways to relax! Sipping coffee while watching the birds in my backyard. At the beach, Listening to music and munching on some of my favorite snacks! Love to sit outside in the sun and read a good book! Also enjoy getting a pedicure or my hair done! I enjoy drinking coffee in my comfy clothes. Watching Netflix with my beagle, Buck, curled up on my lap. I love relaxing on or by the water. It can be in a hammock, on the dock,or in a boat, kayak, pontoon or pedal boat! To relax, I read a good book. Sitting on my deck reading one of my favorite books! I love when someone makes me dinner. Laying on my big fluffy couch! I love a quiet house and a good book or a long nap on a rainy day. I love to curl up with a good book and a blanket outside in the summer evenings! During the winter I love to add a hot chocolate! Quiet time with a magazine! When nice out I sit on my patio and enjoy nature and bird watching. Sitting back and reading a good book while enjoying a glass of wine! A massage to be pampered. A good book to unwind. I relax by taking a shower and using bath and body works products! Love this giveaway! A massage, pedicure, and a glass of wine! Relax with a book on the beach. I love reading a good book or the newest edition of People magazine. I love to watch mindless tv or sit out on the deck. Spending time with my son! Sitting on the patio, drinking coffee, listening to the water from our fountain and watching the birds. I love sitting on the couch watching a movie with my feet up! I love to soak in a hot bath. Take a walk outside with my infant daughter. I especially love when the sun is shinning and the breeze is blowing. I love to start a fire in the fire pit & read a good book. I like to read a good mystery book with a cup of English toffee cappuccino. I love to curl up with a good book. Going for a walk with my little guy!! Taking a walk on one of the many nature trails western Michigan has with my husband and daughter. Gardening, coffee on the patio and walking around the lake! Ilove to read and take a bath! Hot tea and a good book! I also enjoy shopping, of course. Drinking a cup of hot tea while watching a favorite tv show. I love to cuddle with my daughter and read. I enjoy dancing with my 2 year old to old tap and swing dancing clips. Watching a good movie and doing counted cross stitch. Fishing and spending time with family! Reading a good book- snuggled up in a cozy blanket or out on the porch (depending on the season). I love to take a walk and just be outside in nature with my family and friends.